The advance of modern marine coatings and related technologies is not unlike other technical sectors of the maritime industry, primarily driven by emerging regulation from the international, national and regional level, usually in regard to environmental concern. 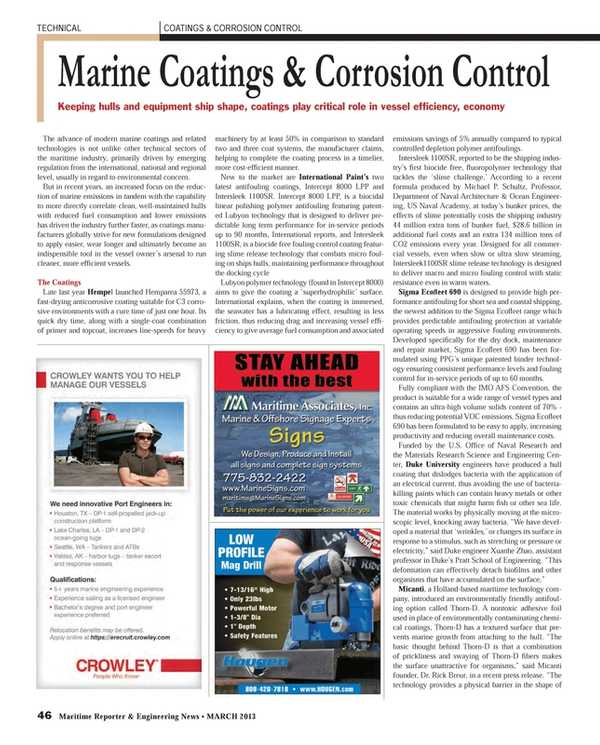 But in recent years, an increased focus on the reduction of marine emissions in tandem with the capability to more directly correlate clean, well-maintained hulls with reduced fuel consumption and lower emissions has driven the industry further faster, as coatings manufacturers globally strive for new formulations designed to apply easier, wear longer and ultimately become an indispensible tool in the vessel owner’s arsenal to run cleaner, more efficient vessels. Late last year Hempel launched Hemparea 55973, a fast-drying anticorrosive coating suitable for C3 corrosive environments with a cure time of just one hour. Its quick dry time, along with a single-coat combination of primer and topcoat, increases line-speeds for heavy machinery by at least 50% in comparison to standard two and three coat systems, the manufacturer claims, helping to complete the coating process in a timelier, more cost-efficient manner. Lubyon polymer technology (found in Intercept 8000) aims to give the coating a ‘superhydrophilic’ surface. International explains, when the coating is immersed, the seawater has a lubricating effect, resulting in less friction, thus reducing drag and increasing vessel efficiency to give average fuel consumption and associated emissions savings of 5% annually compared to typical controlled depletion polymer antifoulings. Intersleek 1100SR, reported to be the shipping industry’s first biocide free, fluoropolymer technology that tackles the ‘slime challenge.’ According to a recent formula produced by Michael P. Schultz, Professor, Department of Naval Architecture & Ocean Engineering, US Naval Academy, at today’s bunker prices, the effects of slime potentially costs the shipping industry 44 million extra tons of bunker fuel, $28.6 billion in additional fuel costs and an extra 134 million tons of CO2 emissions every year. Designed for all commercial vessels, even when slow or ultra slow steaming, Intersleek1100SR slime release technology is designed to deliver macro and micro fouling control with static resistance even in warm waters. Sigma Ecofleet 690 is designed to provide high performance antifouling for short sea and coastal shipping, the newest addition to the Sigma Ecofleet range which provides predictable antifouling protection at variable operating speeds in aggressive fouling environments. Developed specifically for the dry dock, maintenance and repair market, Sigma Ecofleet 690 has been formulated using PPG’s unique patented binder technology ensuring consistent performance levels and fouling control for in-service periods of up to 60 months. Fully compliant with the IMO AFS Convention, the product is suitable for a wide range of vessel types and contains an ultra-high volume solids content of 70% - thus reducing potential VOC emissions. Sigma Ecofleet 690 has been formulated to be easy to apply, increasing productivity and reducing overall maintenance costs. Also declaring reduced application costs, Sherwin-Williams launched Macropoxy 80, a high-build HAPs-free epoxy formulated for application over marginally prepared steel substrates and damp surfaces, lessening the need for costly surface preparations. The coating combats corrosion from both immersion and atmospheric exposures and can be applied at temperatures as low as 0°F. Because of its surface tolerance, Macropoxy 80 can be applied in adverse conditions, and steel substrates need only to be cleaned of loose paint or rust per SSPC SP2-3 Hand and Power Tool Cleaning before application. Its high solids formulation (80%) reduces the likelihood of the solvent entrapment that can lead to premature coating failure. In addition to being HAPS-free, Macropoxy 80 is low-VOC (<250 g/L). GuardLine LTC (Low Temperature Cure), a new cargo tank coating from Advanced Polymer Coatings, is an ambient-cure coating (in the range of 77°F) used on chemical, product and barge tankers to transport a range of liquid cargos. GuardLine LTC only requires a low temperature cure, generating cost savings by eliminating the extra step of a high temperature forced hot air heat cure, which is crucial for the high chemical resistance of the MarineLine 784 system used for chemical tankers and their more hazardous cargos. APC also claims its LTC coating offers greater versatility and chemical resistance and requires less cleaning because it is virtually absorbent-free, giving ship operators the opportunity to carry a wider range of cargos without worrying about the previous cargo residue contaminating the next one. The 2013 NACE International Corrosion Conference offers technical and educational resources, public awareness activities and exhibition. More than 5,000 corrosion professionals are expected to participate, and the exhibition will feature more than 370 companies displaying the latest in corrosion control products and services. The technical program, with more than 30 symposia, will feature several new offerings, including corrosion mitigation of fire protection systems, corrosion issues related to water systems and the environment and the relationship between coatings and CP.